Killer Mike performing in 2014. Michael Render (born April 20, 1975), better known by his stage name Killer Mike, is an American rapper, actor and activist from Atlanta, Georgia. He is the founder of Grind Time Official Records, which he launched through the SMC and Fontana Distribution. Mike made his debut on "Snappin' and Trappin'", from OutKast's 2000 LP Stankonia, and later appeared on the Grammy-winning song "The Whole World", a single from OutKast's greatest hits album Big Boi and Dre Present...OutKast. He has since released five full-length albums as a solo artist. In December 2008, Mike confirmed he signed to fellow Atlanta-based rapper T.I. 's Grand Hustle Records. In 2012, he released R.A.P. 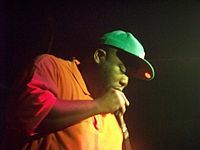 Music, produced entirely by American rapper-producer El-P. Killer Mike and El-P subsequently formed a duo in 2013, branding themselves Run the Jewels; the duo was signed to Fool's Gold Records and released their self-titled debut in June of that year. Killer Mike is also known as a social and political activist, focusing on subjects including social inequality, police brutality, and systemic racism. In addition to addressing themes of racism and police brutality in his music, he has also delivered several lectures at college universities, written about social justice topics for publications such as Billboard, and been the subject of televised and published interviews regarding police misconduct and race relations. He was a visible and vocal supporter of Bernie Sanders during his 2016 U.S. presidential campaign, and declined to support Hillary Clinton after Sanders left the race. Killer Mike has been featured in the films 20 Funerals, Idlewild and ATL. In 1995, Killer Mike briefly attended Morehouse College, where he met producers The Beat Bullies and eventually Big Boi of OutKast. His music debut was a feature appearance on OutKast's "Snappin' & Trappin'" from the 2000 album Stankonia, followed by their 2001 single "The Whole World", which won the 2003 Grammy Award for Best Rap Performance by a Duo or Group. He was also featured on several other tracks that year, including "Poppin' Tags" from Jay-Z's The Blueprint 2. Killer Mike released his debut album, Monster, in 2003. The album's lead single was "Akshon (Yeah! )", which featured OutKast on guest vocals. A remix of "Akshon (Yeah!)" was included on the soundtrack of EA Sports' video game Madden NFL 2004. The album's second single was "A.D.I.D.A.S. ", featuring Big Boi and Sleepy Brown, which peaked at #60 on the Billboard Hot 100. It is Killer Mike's highest charting single to date as a lead artist. Killer Mike has been featured in the films 20 Funerals, Idlewild, and ATL. He has also performed as a voice actor, playing a rapper/actor, turned President of the United States, named Taqu'il in the Adult Swim cartoon Frisky Dingo from 2006 to 2008. Killer Mike guest-voiced a Boost Mobile phone in an episode of the same name of Cartoon Network/Adult Swim's Aqua Teen Hunger Force. Killer Mike opened a barbershop in Atlanta, Georgia with his wife, Shana Render, on November 1, 2011. The two acquired and reworked a barbershop and named it "Graffitis SWAG" (Shave, Wash And Groom). He had waited nine years before choosing to open the barbershop, after having an early business manager advise him against the plan. It took his wife advising him to do it now while he had the time and money to pursue his lifelong dream. He eventually plans to open 150 shops across the United States over time, predominantly in cities with large black communities. The barbershop is decorated with artwork on the walls honoring historic black leaders like Martin Luther King, Jr. Mike said that he hopes to "lift up men in the community who are out of work and help move them toward sustainable, lifelong careers" and give his employees "opportunity for real economic elevation." As of 2012, the shop employed six barbers, with plans to add four to six more licensed barbers to the team. Mike also said that he hoped to pursue his own barber license in the winter of 2012. The enterprise has been successful, and the shop has become a gathering place for the community, in addition to hosting events such as a season premiere for The Boondocks and serving as the setting for several music videos. A second location in Tampa, Florida was planned for 2014. Killer Mike is an outspoken social activist focusing on subjects including social equality, police brutality, and systemic racism. His views are reflected in his music, as well as in interviews with the media. As a publicly viewed figure, Mike feels it is his responsibility to represent African-Americans: "I feel I have to be politically active and I have to be a credit to my race." He has been vocal on the subject of police misconduct, his father being a former police officer. His anti-brutality sentiment can be found on the song "Reagan" from his album R.A.P. Music, and the song "Early" on Run the Jewels 2. "I'm appalled that regular Americans are apathetic. I'm appalled that people choose to use the word 'thug' as a code word for 'n-----.' I'm appalled at everyday citizens... When will we, as an American constituency, tell our politicians enough's enough? Enough mayors supporting murderous police departments. Enough police chiefs having to give excuses for murderous police officers." In an op-ed published in Billboard magazine, Killer Mike stated that "there is no reason that Mike Brown and also Eric Garner are dead today – except bad policing, excessive force and the hunt-and-capture-prey mentality many thrill-seeking cops have adapted." Killer Mike and El-P performed at The Ready Room in St. Louis on November 24, 2014, the same night that the Grand Jury verdict was announced stating that Darren Wilson would not be charged with a crime in the shooting of Michael Brown. Killer Mike opened the set, which began about two hours after the announcement was made, with a heartfelt speech. Fan-shot footage of the speech later went viral. Killer Mike, in an op-ed, defended rap lyrics and says that it should be defended as freedom of speech. "For the people of Baltimore — I don’t criticize rioting because I understand it. But after the fires die down: organize, strategize and mobilize. Like Ferguson, you have an opportunity to start anew. I don’t have a solution because whoever’s there will have to come up with it. But we need community relations: riots are the language of the unheard." He made similar points in an interview with the Harvard Political Review: "Baltimore is an opportunity for us to do something different. As society, there’s a real opportunity to organize there, and if we do not take full advantage of the opportunity to organize, then the riots truly meant nothing." Killer Mike has given lectures about race relations in the United States at several American universities, including New York University and the Massachusetts Institute of Technology. In June 2015, Killer Mike briefly ran as a write-in candidate to become the representative for Georgia's 55th district in the Georgia House of Representatives. Despite encouraging voters to write in his real name, Michael Render, any votes he received would not have been considered valid due to his failure to previously register as an official candidate in the election. Killer Mike stated that his purpose in running was to raise awareness of the special election, and to demonstrate that political outsiders can and should run against established politicians. Killer Mike announced his support of Democratic U.S. presidential candidate Bernie Sanders in June 2015 after Sanders announced his intention to restore the Voting Rights Act of 1965. After introducing Sanders at a rally held in Atlanta November 23, 2015, Mike spent time recording an interview with the presidential candidate. Mike released his interview with Bernie Sanders as a six-part video series the following month. In the following months, he remained an active and vocal supporter of Bernie Sanders, delivering speeches at rallies, voicing support in televised interviews and on social media, and traveling with the campaign. In February 2016, Killer Mike received criticism during his activism for Bernie Sanders for quoting American anti-racism and LGBT advocate Jane Elliott regarding Hillary Clinton, which was criticized as misogynistic and mistakenly attributed as being his original phrasing online and in the press. Following Sanders' exit from the race, Killer Mike refused to support Clinton, whom he perceived as pro-war. ^ "Past Winners Search". Grammy.com. Retrieved May 1, 2015. ^ a b D'Angelo, Joe (June 24, 2003). "Blink-182, Outkast, Bone Crusher, Joe Budden Score Tracks On 'Madden 2004′". MTV.com. Retrieved April 23, 2015. ^ Arnold, Paul (December 8, 2008). "Exclusive: Killer Mike Confirms Signing With T.I.". HipHopDX.com. Retrieved April 22, 2015.